When you've waited twenty-five years, four months, twenty-eight days... whats another day... or two? 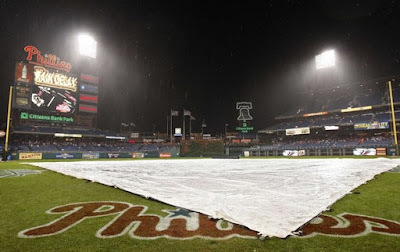 Many have been postponed over the years, but first Series game ever to be halted mid-way? With rain running through the day today, winds howling and temps just getting out of the 30s, smart money says we're looking at three innings tomorrow night. Keeping with the surreal nature of it all, the day's slated to begin with snow. SVILUPPO: As expected, Game Five's tentatively scheduled to resume at 8.37 tomorrow night.